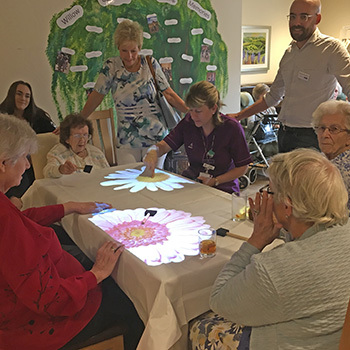 Residents at Anchor’s Willow Gardens care home in Yateley, Hampshire are making the most of the new Tovertafel (‘Magic Table’ in Dutch) installed earlier this year. The Tovertafel contains a series of activities for people living with mid to late stage dementia. It has been designed to encourage instinctive participation, inviting engagement and stimulating a level of physical and social activity rarely seen in people living with dementia in the later stages of their journey. This award-winning innovation comes from The Netherlands, which is renowned for its cutting-edge approach to dementia care. Angela McCormack, Willow Gardens home manager said: “This great new device is really popular with the residents here at Willow Gardens. The visuals mean people can play games in groups or individually and with varying levels of dementia, which makes it really inclusive. “There is no doubt it is helping those living with dementia here, but it has other benefits too; it helps others improve their hand/eye co-ordination and one of the most delightful things to see is the total joy it brings to residents playing the simplest of games." Find out more about Willow Gardens here.